For events, news and other useful information about Cahir click on the graphic to visit the Cahir News Online website. Click on the icon if you wish to visit the Station-Stays website which has details about accommodation within walking distance of Cahir railway station. Cahir's principal attraction is Cahir Castle on the banks of the River Suir in the town. It is open to the public throughout the year. The Swiss Cottage is a a delightful ornamental cottage open to the public for several months a year. The walk to it is particularly pleasant; through a wooded area, past the golf course and just before arriving one crosses a small bridge across the River Suir. The path commences near the river bank adjacent to the car park behind the tourist office (allow 20 to 25 minutes each way). There are a number of bench seats along the way. The Craft Granary is located on Church Street a short walk from the railway station. Coming from the railway station take the short street at the side of Cahir Post Office (a few steps beyond The Craft Granary) and turn left at the end of it to access this path. The path ends across the road from Cahir Castle. Walking time: 5 minutes or less. The heritage trail takes in buildings and features of interest around the town. This garden is a haven of peace just a two minute walk from the railway station. The nearby church is St. Paul's Church of Ireland. Guided tours of the church are available. 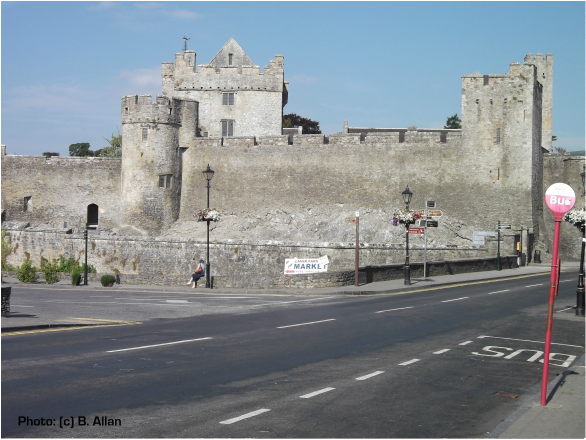 The Visit Cahir website has further information on Cahir (opens in a new window). There is a seasonal tourist office near the castle.